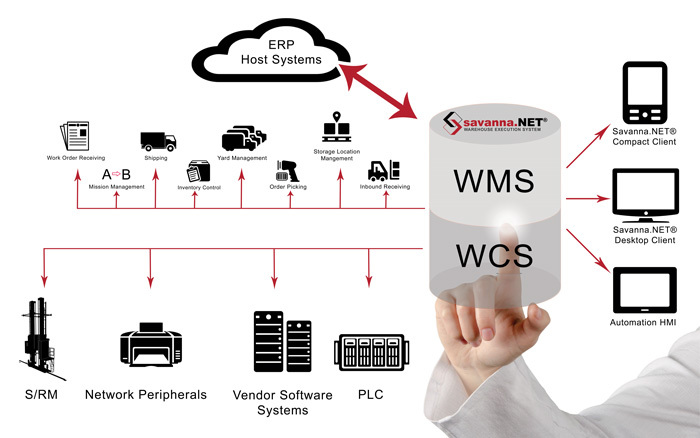 Westfalia Technologies’ Savanna.NET® Warehouse Execution System (WES) is a tightly integrated warehouse management system (WMS) and warehouse control system (WCS) solution. As a system-wide software solution, Savanna.NET® directs, controls and optimizes material flow within and between warehouses. Operative control includes optimizing paths throughout the system – from inventory creation through shipment – keeping your inventory organized in the most efficient manner. Savanna.NET® supports warehouse process execution using a corresponding flow of real-time information, ensuring data security and stock transparency. Furthermore, the application provides the information necessary for analysis and management control in a clear and concise manner. The Savanna.NET® WES enables companies of any size to implement only the functionality needed to address their warehousing process needs. Its functionality is also easily enhanced by client-driven customizations. While a WES is able to replace WMS and WCS applications altogether, its flexibility allows for various deployment options. For those with an existing WMS looking to introduce a WCS to assist in automation, it is best to opt for a WES instead. This allows the company to continue using its familiar WMS, integrate it with the WES, and then enable only the WCS functionality. Alternatively, if an organization has not yet introduced automation warranting a WCS, they are still able to implement a WES, only utilize the WMS capabilities, and then "turn on" the WCS functionality when needed. This allows operators to utilize a familiar user interface, reduce training time and shorten the system startup duration. Flexible implementation. The Savanna.NET® WES platform can manage the entire warehouse process, or only the aspects of your operation that require more sophisticated and accurate measurement and/or management. A key benefit here is scalability. If your operation will be growing in volume or geographic coverage, being forced to implement an entirely new WES from scratch in the midst of expansion will slow you down — if not derail your plans — as has happened time and again in the warehousing and distribution sector. Focus on the inventory system. For most distribution and warehousing operations, inventory is the biggest dollar asset — and as such, presents big exposure to losses through lost inventory, dead or slow-moving inventory, overstocks and incorrect valuations;, all of which are most often caused by improper or insufficiently monitored procedures for receiving, picking and costing. Our WES is designed to bring the highest level of precision to your warehouse inventory management, by monitoring inventory from receiving to shipping, so that all costs are captured, and inventory turns are correctly calculated and properly picked. Supports all inventory organization configurations. One factor that makes every distribution or warehousing operation unique is that no two warehouses processes are exactly alike. The Savanna.NET® WES is designed with flexibility in mind, to accommodate virtually any racking system, material handling equipment, aisle layout and ceiling height. Reduced inventory levels. Better monitoring and management of lead times, demand and other factors enable you to maintain target fill rates without excess inventory. Speed up order picking. Non-robust WCS systems or reliance on non-automated picking systems do nothing but add time to the job — and also increase the opportunities for error. Our WES, with its robust WCS functionality, enables operations to increase picking speed, often dramatically. More engaged employees, which serves to improve morale and employee retention. A safer work environment, helping to reduce the opportunity for injury and downtime. Greater customer satisfaction, with orders being processed more quickly and more accurately. Our overall system design philosophy is to help you improve not only your entire warehouse process, but also provide you with a technology platform that your staff sees as a positive rather than a headache, and one that your customers see as an improvement rather than a disruption. Please contact us now to discuss your warehouse inventory management challenges and objectives. We are eager to learn more and determine whether we can be of help.